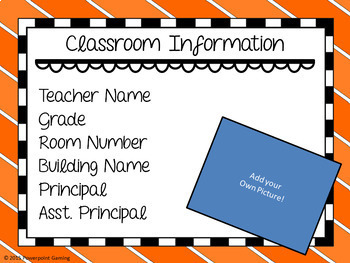 Show students and parents what your school or classroom is all about with this wonderful information display. 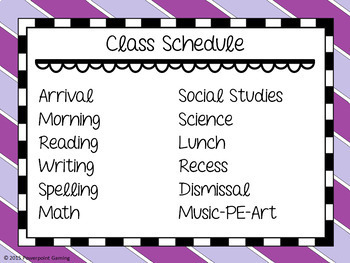 Each slide display information about various topics in your classroom ranging from teacher information and behavior plans to homework policy and snack time information. 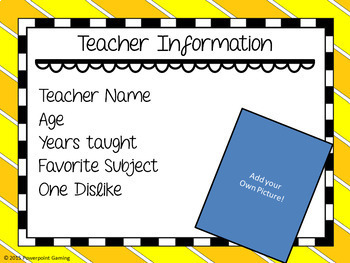 Each slide is editable so you can add your own clip art, backgrounds, and photos. 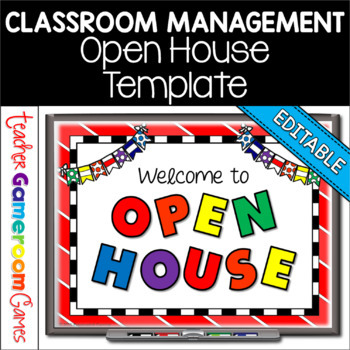 Perfect for a Open House or the first day of school. Great for individual practice on the iPad! Extra licenses are $1. Fonts by KG Fonts (KG Follow You in the World). Clip art by Creative Clips- Krista Wallden. ✂ 7-17-2015 -Fixed Snack Slide, Flattened first and last slide. Please leave feedback for my product! Earn TPT Credits! Thank you for your purchase! By purchasing this product, you agree not to share, resell, copy, or alter this product in anyway. You agree not share without the purchase of multiple licenses. All sales final. Clip Art is not included as a separate file and is included as part of the background.